Volkswagen has released the first images and details about the production version of the most powerful convertible Golf GTI, which will replace the current model. And most of all, the photographs we see the final version of the new items. The "live" it can be evaluated in early March at the Geneva Motor Show. 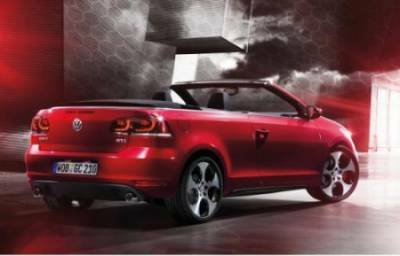 As we have mentioned earlier, the 2013 Golf GTI Cabrio has at its disposal a turbocharged 2-liter four-cylinder engine. It generates 210 hp and a torque of 280 Nm at 1700 rpm. Operates power unit in conjunction with six-speed manual or optional six-speed DSG gearbox with double clutch. All this allows us to accelerate to "weave" in 6.9 seconds and a top speed of 236 kilometers per hour. Convertible Golf GTI is equipped with a soft top that retracts or extends an electric drive in 9.5 seconds. Remarkably, this can be done at a speed of 30 kilometers per hour. Sales will begin in the second half of 2012. With prices not yet clear, but they will be announced closer to launch date.